The first Indian Motorcycle was built in 1901. The Hendee Manufacturing Company, owned by George Hendee and Carl Oscar Hedstrom made history, in Springfield, Massachusetts, by producing the first motorcycle built in the Country. Production rose from 500 per year to over 32,000 in 1913. Indian Motorcycle built the first V-twin engine in 1907. Though it was a record breaker, the motor was revamped into a side valve V-twin in 1916. Reaching speeds of 60mph, this 1000cc engine was more powerful and quieter. In the early 20's the Scout and the Chief were introduced by Indian Motorcycles. Gaining a reputation for reliability and strength, they quickly became the most successful models. When the Indian Scout was introduced in 1920 it has a 596cc motor. The Scout was increasing in popularity and by 1927 so did its engine size, to 745cc. The Sport Scout was introduced in 1934, after a bad reaction to cost cutting measures a few years earlier. After winning the Daytona 200 in 1937, the Scout went on to be used in WWII. The Chief was first made by Indian Motorcycle in 1922. Starting with a 1000cc engine that was increased to 1200cc that next year, the Chief's popularity grew. Although it was already capable of reaching speeds of 100 mph, the engine was enlarged to 1300cc in 1950. Production of the Chief ended in 1953 as financial problems fell upon Indian motorcycles. Under new control in 1945, Indian motorcycle began to create new lightweight bikes. By 1953 all manufacturing had stopped due to poor design and lack of development. 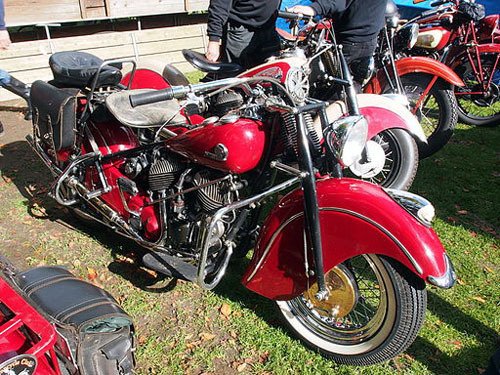 Foreign motorcycles were imported from Europe and sold under the Indian Motorcycle name for the rest of the 1950's. In 1999, a company from California tried to reclaim the Indian Motorcycle fame, but in its infancy the company filed bankruptcy in 2003. Today with a new home in Kings Mountain, North Carolina, The team of Steve Heese and Steven Julius are trying gain to revive the Indian Motorcycle name. Slated to start production in late 2007, the Indian Chief is scheduled to be available for the 2008 model year.